Home »Bioscience » Can Printing Organs Shorten Transplant Waiting Lists? Every ten minutes another name is added to the national organ and tissue transplant waiting list. Every day twenty people die waiting for a transplant. Partially responsible for this unfortunate reality is the fact that only 54% of Americans are registered donors, and an even smaller proportion are actually able to donate. Nearly all complex transplant tissues are dependent on donors, and the need for transplants shows no signs of abating. Those on the waiting list cannot rely solely on donations to save their lives; consequently finding alternative solutions is vital. Advanced by developments in health sciences, the day of 100% organ availability is approaching. Originating in the early 2000s, bioprinting uses 3D printing technology with materials that incorporate viable living cells. Since scientists discovered that living cells could be sprayed through an inkjet printer’s nozzle without damage, the possibilities have expanded. 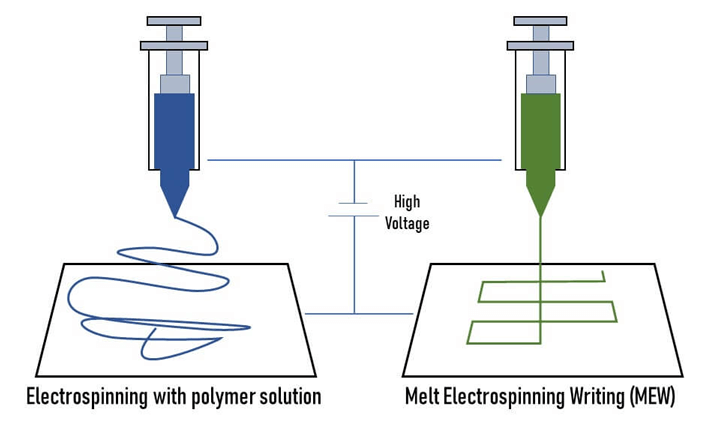 Electrospinning, an innovation in bioprinting, uses high electric voltage to create an electric field between a polymer solution at the tip of a needle and a plate. The resulting field causes the polymer to jet forward and create a web-like structure called a hydrogel upon which living tissue can grow. Today, using multiple print heads to squirt different cell types, along with polymers that maintain a structure’s shape, it is possible to deposit layers of cells that bind together and grow into functional tissue. This technology could create 3D-printed microfibers, the building blocks for tissues to substitute for or repair a specific body part. At Germany’s Technische Universitat Munchen, scientists are working to develop new cartilage-restoring and cell-rejuvenating 3D-printed microfiber scaffoldings. They are using Melt Electrospinning Writing (MEW), a revolutionary type of electrospinning that lacks toxicity often present in other kinds. Dr. Dietmar Hutmacher, a professor at the Queensland University of Technology (QUT) in Australia, is one of the lead researchers on this project. He, along with postdoctoral fellows Onur Bas and Christoph Meinert, has played a key role in the understanding of MEW. This research group had to develop their own 3D printers in order to make printing small diameter fibers possible. “Having very small fibers is important because it allows cells to enter on the surface, providing more surface area since we are trying to downscale existing technologies,” said Dr. Bas. Solution electrospinning used to be the standard procedure for bioprinting as it allowed channeling of polymers to form very fine fibers similar to that of human tissue. However, this approach was uncontrolled and resulted in potentially toxic hydrogels, making it less than ideal for medical applications. “Electrospinning, in its traditional form, leads to random alignment of fibers that are deposited chaotically,” explained Dr. Meinert. One of the revolutionary traits of MEW is that these fibers are not randomly aligned, but rather can be placed at the discretion of operators, improving the success rate and quality of the printed fibers. Additionally, the research team at QUT has figured out a way to reinforce the weak and brittle hydrogels currently used for bioprinting through the incorporation of polycaprolactone (PCL). “We combine the best of two worlds. We combine the stiffness of a 3D-printed plastic scaffold with the biological advantages of a hydrogel,” said Dr. Meinert. Although it could take years before these advancements reach the clinical trial stage and finally make their way to healthcare, the potential applications of this breakthrough are numerous. “We are trying to treat cartilage defects [e.g. osteoporosis] early on after they occur,” Dr. Meinert concluded. This new method of creating microfibers is thus providing new hope for patients racing against time while sitting on the transplant waiting list. Zhou, Yufeng. 2017. “The recent development and applications of fluidic channels by 3D printing.” Journal of Biomedical Science, 24 (80): 1-22. Gopinathan, Janarthanan and Insup Noh. 2018. “Recent trends in bioinks for 3D printing.” Biomaterials Research, 22 (11): 1-15. Gu, Bon Kang, Dong Jin Choi, Sang Jun Park, Min Sup Kim, Chang Mo Kang and Chun-Ho Kim. 2016. “3-Dimensional bioprinting for tissue engineering applications.” Biomaterials Research, 20 (12): 1-8. Tack, Philip, Jan Victor, Paul Gemmel and Lieven Annemans. 2016. “3D-printing techniques in a medical setting: a systematic literature review.” Biomedical Engineering Online, 15 (115): 1-21. My name is Flavia Codreanu, and I am a junior at UTS, a STEM-focused high school in Toronto, Canada. I’ve always had an interest in health sciences and writing, and I joined Curious Science Writers this year to combine these two interests and help make sense of the emerging science that affects our personal health. Thank you for taking the time to read my article, one of many produced by cSw student staffers to introduce readers to new research and scientific discoveries. Wow, this article is an awesome read! I adore how smartly you wrote organ printing, almost sci-fi in its amazingness, into a hopeful reality! Very informative read! Bioprinting really shows how blending biomedical science with technology can create a substantial impact.